Astrophysicist Neil deGrasse Tyson (L) and writer/director Ann Druyan at the Fox and National Geographic channel screening of "Cosmos: A Spacetime Oddyssey" on Aug. 3, 2014. 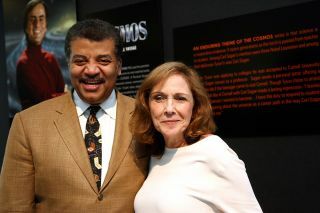 LOS ANGELES — A new season of the science TV series "Cosmos" is set to premiere in the spring of 2019, penned by one of the show's original creators, Ann Druyan. Earlier this month, Druyan talked with reporters about what fans can expect from the new series, and discussed the role of science in the modern world. Druyan, a long-time science communicator, co-wrote the original 1980 TV series "Cosmos: A Personal Voyage" together with her late husband, astronomer Carl Sagan (who also hosted the series), and astrophysicist Steven Soter. Druyan and Soter reunited to write the 2014 follow-on series, "Cosmos: A Spacetime Odyssey," for which they shared an Emmy Award for writing. Astronomer Neil deGrasse Tyson will return as host for the new series, titled "Cosmos: Possible Worlds." What follows is an edited and condensed transcript of Druyan's interview with a small group of reporters on Jan. 13 at a press event hosted by National Geographic in Los Angeles. What can viewers expect from the new season of "Cosmos"? Ann Druyan: We have some new, recurring set pieces. You may recall from the previous season we had the Halls of Extinction, the Cosmic Calendar and the Ship of the Imagination. They will be back. But we also have a Palace of Life, which we're very excited about. It's kind of the opposite of the Halls of Extinction. [For the latter,] the idea was, these are the halls of the broken branches of the tree of life. This Palace of Life is the ever-branching beauty of life and the glory of it. Ann Druyan at the 74th Annual Peabody Awards Ceremony on May 31, 2015 in New York City. Another thing we're doing is that "Cosmos" has a view of the future which I believe has the power to inspire. So much of what we see, and so much of what our kids and grandchildren see, is so dystopic and despairing. It's like … our punishment for all our sins is just around the corner, and humanity doesn't have a future, except the one that's choking and dying. And in "Cosmos" we imagine the future that we can still have. In one of the episodes, we go to other worlds, because this is the golden age of discovery of other worlds. As dismal and hopeless as things may seem to all of us, there is something extraordinary happening, which is that in only the last 10 years we've discovered thousands of new planets around other [stars]. We're now developing new strategies to be able to assess whether or not life is present on these worlds at the interstellar distances that are involved. It's really remarkable, and yet, our kids don't feel that, I don't think. And I think it's wrong to expect them to do the hard work that it takes to know a complicated subject deeply if we don't give them a reason [to do that], to become a mathematician, a scientist, an engineer, a technician. And that's one of the reasons why I'm particularly excited about the new stories [in the upcoming season]. They are new in the sense that they have truly never been told before. I can say this with such authority because I've talked to some of the great historians of science who had never even heard of these people. And yet, in each case, they were willing to give it all — to die even — in the service of science, of just adding another brick in the wall of our understanding of the universe. And so, we hope to tell those stories to inspire a whole new generation of kids to want to do those things. Who are some of these scientists whose stories you'll be telling? I kind of want to keep those close to the vest, because in my research, I was really surprised to discover some of these people. One of them is someone who [I discovered] just after Carl [Sagan] died. I was kind of really depressed and heartbroken, and I was going through our library and I found this very thin volume, which was about the life of a [particular] scientist. [Carl and I] had worked together on all these books and shows and everything — we were together 24/7, but he and I had never discussed this one little book. But I found his notes in the margin, in his tiny Brooklyn-public-schools scrawl. And I realized that if I ever got the chance, I was going to tell the story of this person and their colleagues, who were heroic on a scale that I don't even understand. And so, I'm really thrilled that we're going to be doing that this season. I can't wait to tell the world this story. Because to me, it's the opposite of the nightmare that we're living right now. It's the polar opposite. It's a world in which it matters so much what's true. And human dignity matters so much that you're willing to stand up to one of the scariest and most heartless people who ever lived. That's the seed at the heart of "Cosmos." Ann Druyan with her late husband, astronomer and science communicator Carl Sagan, in 1984. The previous season of "Cosmos" premiered in 2014; why such a long delay between seasons? It takes that long for me to figure out what stories I want to tell. Because you have to really educate yourself, or I do, because my ignorance is vast. And because I am looking for stories that are [about] lives that are motivated by an idea in science that turns out to be valid and changes the world for all of us even though we don't know it. So that's kind of the criteria. It can't just be "So-and-so did this really good scientific thing." It has to also be her life story. We're a story-driven species. We need to know these stories to understand the meaning of the work. And I think one of the great tragedies of my own education … was that the science was denuded of all the passion and the feeling. Now, obviously, when you're doing the science you have to be dispassionate, but once you've figured something out, that doesn't mean the rest of us can't really feel [the passion that went into the discovery]. And I think that's the reason "Cosmos" remains so special to people. I think it works on many different levels, and it's not afraid of the visual beauty and the feeling. But I don't think we ever cut corners on the rigors of the science and the data. We try not to. We never do that knowingly. Cosmos is a show largely about astronomy and astrophysics, which are both fields constantly being updated with new discoveries. And yet, the show has always had a timeless quality about it; we can still watch the original 1980 series today. Are you taking that approach in the new season, or will we see some of the cutting-edge discoveries that have come about in recent years? You're absolutely right — that was Carl's original idea. He didn't want the flavor of the month. He wanted [to include] the stuff that was still going to be true 10 years from now. We're not a science magazine show. What we're more interested in is creating a kind of global scientific literacy. Because we really believe that science is a birthright that belongs to every one of us. And the degree to which we're excluded from science is the degree to which we are powerless. We can't be informed decision-makers. But in the new season, we do feature some of the most astonishing findings of the last few years. Some of the great leaps forward in science that we can't ignore and we know have been borne out on many independent lines of confirmation. So, yeah, we're not afraid of some of the cutting-edge aspects of science, but it has to be … not arcane. What is your target age group for "Cosmos"? When I first started pitching the second season and it went to all the networks, I said, "We're going to bring back the family hour on network television. People are going to watch this with their kids, with their spouses, with everybody." And that was the enormous gratification of the Twitter feed when ["Cosmos: A Spacetime Odyssey"] premiered — people were tweeting, "I can't believe I'm in the same room with my whole family and we're watching 'Cosmos!'" And that's our idea. We feel that it has to work on so many different levels in order to succeed. Like any work of art, it can't just be for one group or one moment. What's your general approach to the current distrust of science, and is that something you incorporate into the show? We deal with this much more directly in the new season. I think [distrust of science] is a completely legitimate point of view, because science has been misused. It will always be misused, because humans are using it. Think of how religion has been misused, how politics have been misused, manufacturing, medicine — every human undertaking has been and will be misused because that's who we are. But my theory is that … the more people [there are] who are comfortable with the ethos, the language and the methodology of science, then the less likely [it is that misuse] can happen. It's our ignorance which puts us more at the mercy of science than anything else. And if we're supposed to be informed decision-makers about where we allow science to go and where we don't allow it to go, then we have to understand it. In the previous season, there was an episode about Venus being a harbinger of what could happen to the Earth if we don't address human-induced climate change. Is there any kind of follow-up to that in the new season? Oh, yes. I think the most emotional episode will be that one. What we did in that [episode about Venus] is that we tried to take every objection to climate change that anyone could have — things like, "Maybe it's a natural cycle," "Maybe it's the sun," "Maybe it's this other thing." We addressed every single objection that we could think of. And so, we made our argument there. This new season is a little bit more visionary in terms of our approach to that: what it means to be on the brink of making a mistake with the whole planet. You know, the planet will go on, other species will survive. The tardigrades will be fine. But whenever I think of this, I always think of all the generations of our ancestors who struggled so hard to create the civilization that we live off of now, and the idea that we could render all of that meaningless with our short-term thinking and our selfishness. Its horrifying. So, I'm really hoping that the new episode on that very subject may be a kind of gut punch.